Thanks to Twitter user @ayolo for sharing this photo after checking in at the Streaming Media West show in LA, (#smwest) which opened up this morning with workshops from Adobe, Microsoft and Jan Ozer. 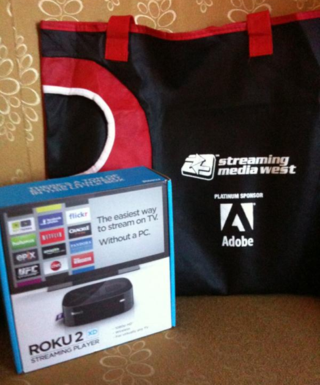 Attendees who buy a conference pass can get a free Roku 2 while supplies last. Just show up to the registration counter, use the discount code of DRF1 and get a free Roku 2 when you register for a Platinum, Gold or Combo Pass until we run out of them. And if you can’t make it to the show, you can still check out Tuesday’s keynote from Susan Panico, Senior Director of the PlayStation Network and Wednesday’s keynote by Matt Strauss, SVP and GM of Comcast Interactive Media. The keynotes will kick off at 12pm ET on the home page of StreamingMedia.com.